Make this year your sweetest ever with the Honey of the Harvest Club! 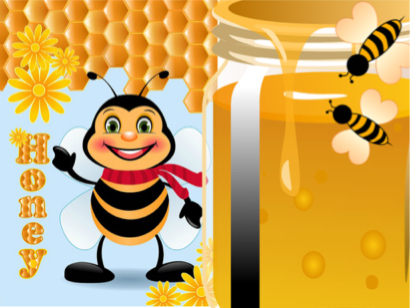 We'll send you honey fresh from Florida as soon as it's harvested, all year long! You'll savor every drop! Floral varieties may include (but are not limited to): Tropical Wildflower, Avocado Lychee, Orange Blossom, Saw Palmetto, Mangrove, and more. You'll receive a 16 oz. squeeze bottle with safety lid, free recipes, and the ongoing joy of supporting local beekeeping and helping to save the bees! When you join you'll get a FREE honey-filled "baby bear." You'll also get goodies and gifts throughout the year! You'll also receive a quarterly e-newsletter that will entertain and inform you about the ongoing world of the honeybee. We'll ship you your first jar of honey as soon as you join! Then, we'll contact you so you can decide whether PayPal or credit card is most convenient for you moving forward. And that's it! There's no membership fee! Only $13.00 per 16 oz. bottle. Just sit back and wait for your yummy honey to arrive. Our sultry subtropical climate produces nectars that are unique to Florida. Saw Palmetto honey is available only in a small swath of land from Tampa to Miami. Developers and the housing boom have nearly destroyed the rest of this palm's habitat. (Luckily we have it growing in our yard and right down the street at the park!) Avocados and Lychees grow in places like India and Sri Lanka, but they don't blossom at the same time to create one honey like they do here in Miami. Mangrove honey is delicious and tastes almost like butterscotch. It comes from our vanishing Florida wetlands. The more you learn about the honeybees, the better for everyone. (That's where our newsletter comes in!) They are such an essential part of our food chain. One in every three bites you take is entirely honeybee dependent, even if you never eat honey and subsist on only burgers and fries! Their pollination keeps us all well fed and alive! Einstein once said that if the honeybees die, humanity has only four years. And now, honeybees are perishing at an alarming rate. The best hope for the salvation of the honeybee is the backyard beekeeper! And so, when you join the Honey of the Harvest Club, you are helping your health, the bees, and humanity! Isn't that sweeeeeet? Note: If you are from Miami and wish to pick up your own honey, please mention that in "Additional Information" when checking out. We'll then refund you your shipping cost!